SPEAKING after the resumption of the Dáil last week Sinn Féin Social and Family Affairs spokesperson Arthur Morgan TD said the recent emergency budget is another example of the Government targeting the most vulnerable sections of society. “The Government’s claim that the cut in rent supplements will not affect tenants because of falling rent is untrue. 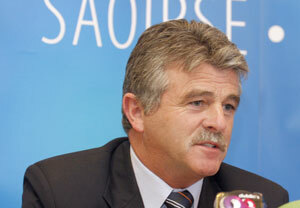 Rents in urban areas such as Dublin have not fallen according to groups such as Threshold”, he said. “The decision by the Government to reduce rent caps and rent supplement levels by up to 10% will hurt thousands of low income Irish families. Every year the level of evictions increases due to the non-payment of rent. “The idea the Government has put forward that landlords will pass on reductions to tenants is farcical. Landlords and builders are getting away practically scot free while low income earners are once again being made to pay. “While Government is cutting back on the rent supplement €200 million will be ripped out of the social housing fund. Cut backs in the housing fund will further exacerbate the accommodation crisis. “The halving of Early Childcare Supplement, to be followed by its abolition next year, is being presented as progressive reform. It is another cut and it is being replaced with the promise – and so far only the promise – of a free Early Childcare & Education year for pre-school children. Sinn Féin has long argued for direct State provision of childcare and investment in childcare infrastructure. Now, on the basis of so-called savings, we are seeing a half-baked scheme being brought in and supposedly ready to be up and running in less than nine months. Who will provide the staffing and funding? The Government is already cutting teacher numbers in primary schools. How is free universal pre-school access going to be provided?